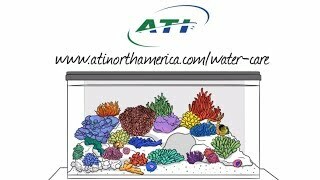 ATI’s line of water treatment products is a comprehensive care system for your aquarium. By using ATI Essentials you can work smarter—not harder—to supply all the essential elements your tank needs in one easy-to-use system. Let ATI do the math and chemistry for you! Get complete water quality analysis with ATI Lab mail-in water testing service. Use your results as a recipe for success to fine-tune your aquarium using ATI Elements for maximum coral health and growth. Been dosing ATI Essentials Pro for a couple of months now. I haven't done any ICP tests and instead have been doing 15% water changes every 2-3 weeks. Alk, CA and MG have been very stable (Hanna and Red Sea tests) and I have noticeable growth. Colors are good and several washed out Acros have started to color back up. I was using the previous iteration of this, the non-pro essentials. This is a far stronger solution, is pre-mixed and is three part in two bottles. I much prefer this to triton and no water changes is life changing! Happy to be able to dose this with my DOS since it’s now two parts.